The most exciting time of the NBA season, aside from the Playoffs, has come and gone. While there were some big trades that occurred, the trade deadline was mostly underwhelming. The two biggest deadline deals transpired a few days before the Thursday, Feb. 23, deadline. The first trade sent power forward Serge Ibaka to the Toronto Raptors in return for almost nothing. This deal was extremely lopsided in favor of Toronto, who only gave up wing Terrance Ross and a 2017 first-round pick, which Toronto assumes will be very close to the end of the round. This trade fills Toronto’s biggest need by giving them a great third scoring option behind Kyle Lowry and DeMar Derozan who shoots well from 3-point range and protects the rim as well as any power forward, a rare combination in the league today. This trade instantly propels the Raptors to the second best team in the East, and the team with the best chance to dethrone King James and the Cavaliers. Additionally, this was a terrible trade for Magic General Manager Rob Hennigan, who acquired Ibaka from the Oklahoma City Thunder in the offseason. Orlando sent shooting guard Victor Oladipo, power forward Ersan Ilyasova and a 2016 first round pick to OKC in return for Ibaka. Then at the break they flipped Ibaka, whose contract expires after this season, to Toronto for Ross and a pick. Essentially, Hennigan traded Oladipo, Ilyasova and a first-round pick that turned into Domantas Sabonis for Terrance Ross and a worse first-round pick. 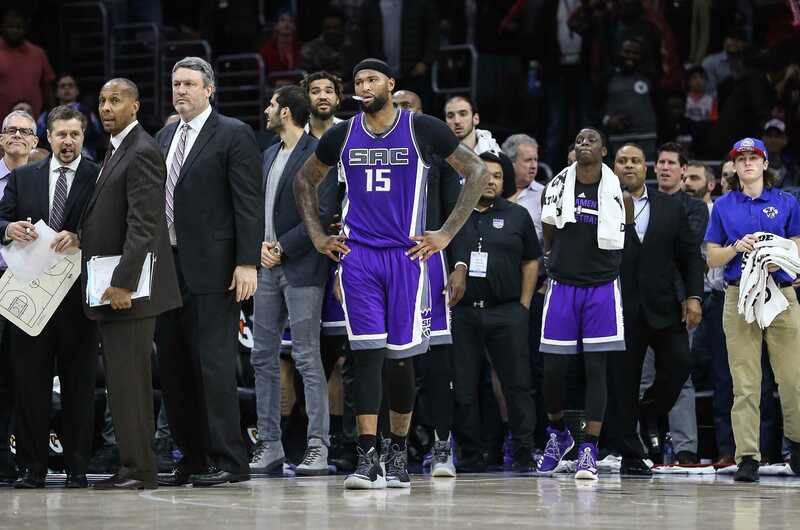 In the biggest trade to occur before Thursday’s deadline, the Sacramento Kings finally decided to trade center DeMarcus Cousins. After years of debating whether or not to send Cousins elsewhere, General Manager Vlade Divac and owner Vivek Ranadive pulled the trigger on a trade and sent him to New Orleans. This trade, however, could cost Divac his job in the long run. According to The Ringer’s Bill Simmons, Sacramento traded Cousins, one of the ten best players in the league, “for 40 cents on the dollar.” In return for the league’s most talented offensive center, the Kings only received rookie guard Buddy Hield, Tyreke Evans, Langston Galloway and 2017 first- and second-round draft picks. This trade immediately places the Pelicans’ frontcourt as the best in the league as they now start the best center, Cousins, and power forward, Anthony Davis, in the NBA. Now, if New Orleans can figure out the rest of its roster they may have a chance to sneak into the playoffs as the eight-seed. One of the best deals that happened on Thursday was the Houston Rocket’s trade with the Los Angeles Lakers for Lou Williams. The trade sent Williams to Houston in return for Corey Brewer and a 2017 first-rounder. This is a great trade for both sides as it gives the Rockets another scorer who can dominate the ball and run the offense when James Harden is off the floor. It also adds another great shooter around Harden that could help in a potential playoff series against the Warriors. This was a great trade for L.A., too, as it got rid of their best offensive player, thus expediting the tank process this season, and also gives them another first round pick in case they lose their top-three protected first-rounder this year. One other trade that perplexed me was the Philadelphia 76ers’ trade of center Nerlens Noel to the Dallas Mavericks. This was a terrible trade for Philly, who received Andrew Bogut, Justin Anderson and a 2017 first-round pick in return for Noel. Trading Noel made no sense because he gave the 76ers the capability to play alongside Joel Embiid, the future of the franchise, while Jahlil Okafor does not. Instead, Philadelphia GM Bryan Colangelo opted to send the better of the two out of town for a poor return. This trade deadline left a lot to be desired, as teams in contention with room for improvement, such as the Celtics, stood pat. Many expected small forwards Jimmy Butler and Paul George to be on the move last week, but after the deadline they remain where they started the season. It will be interesting to see how the many deadline deals affect the remainder of the NBA season.